If you’d like to feel ten times better than you do today, with more energy, less pain and feel more like yourself again (or even super-human) , this will be one of the most exciting letters you’ll ever read. This isn’t one of those “magic pill” websites that promises you will feel superhuman, pain and symptom free without doing a thing. And this isn't one of those "diet plan de jour" websites that gives you a near impossible to accomplish restrictive diet that no one can follow either. The system outlined in this book has worked great for me, and I believe it can help you, too. But I’m not suggesting that everyone (or anyone) who reads it is going to be “cured”. I don’t know how the people who read this book will feel – it’s likely that many or most of them will feel just the same (especially if they don’t follow the step-by-step directions and put in some effort). First of all, this isn’t like any health book you’ve ever read. There’s no fluff or filler – just "real-life" tried and true tactics that are working right now to solve inflammation, energy and food sensitivity issues. It’s About MORE than Just Skin Issues, Fatigue, Nerve Pain And Mental Focus. See, you can use the same system in this book to find the triggers to all kinds of ailments…from Headaches, Stomachaches, Heartburn and Diarrhea to Chronic joint and Muscle Pain to Anxiety and Depression. For example, my mom used just a part of the system (outlined on page 56) to determine eggs trigger her arthritis. A 3rd grade English teacher used the strategies outlined in the book to determine the Gouda cheese and red wine she drinks today, triggers her epic sneezing attacks two days from now! As strange as it sounds, it's true. Her sneezes were so violet and relentless they literally injured her ribs and lower back and would cause her to rub her nose raw. Now her attacks are mostly gone and it turns out she enjoys white wine with dinner just as much as red! Plus, she can still drink a glass of red wine now and then without a problem too! You’ll lean all about delayed triggers and what to do about them in the illustration on page 32. A grandmother of 4 used the same strategies to find the trigger to her horrible Heartburn... and then started using the same strategies to find the trigger food to her arthritis and joint pain. You can use the same system, like many others have, to track down food triggers for Inflammation, migraine headaches, anxious sleep or 150 other ailments that have been linked to food sensitivity. How to biohack your food so you get through the day with LOTS OF ENERGY left to do the things you need to do around the house and for the fun things you want to do with your family...without taking stimulants, drinking loads of coffee or anything like that. See page 21. How to eliminate any resistance, doubt or skepticism you have about becoming "Superhuman". We all start here. Stick to this proven "breakthrough the resistance" plan and you'll see RESULTS quickly. Page 22. Surprise, surprise...your "secret enemy" preventing you from becoming a better you is NOT you and it's NOT your doctor! Discover who IS standing in your way from transforming your life and feeling better and what to do about it on page 46. Discover why ORGANIC beef, chicken and pork may actually be the WORST thing for you to eat and which beef, chicken and pork you should eat instead. Hint: It's feed they "sneak" into the animals food that's the problem. See page 59. Unlock the truth behind INFLAMMATION and food sensitivity...this alone is worth the price of the book. You're getting the same little known tools and strategies some of the world's most EXCLUSIVE Integrative and holistic practitioners use with their A-list celebrity clients to solve their toughest ailment mysteries. You need to eliminate your favorite foods, right? WRONG! Learn why randomly eliminating foods is the exact wrong thing to do on page 15. What you (and everyone else who has a food sensitivity) have in common with Walter White - the main character from the hit TV show Breaking Bad--trust me, it's not what you think it is...you're going to love this story. Page 17. The #1 thing to do right now if you want to solve your mystery ailments and discover what’s triggering them. See page 4. What to do if you suspect you have a food sensitivity but have no idea which food is the problem. See page 8. Why food triggers are so hard to find and how exactly to find yours. Page 32. Can a "healthy food" all the gurus tell you to eat really be like poison to your body? The answer is YES! Learn how, why and which ones on page 20. If you "wake up tired" after a full night's sleep at least once a week, chances are you have at least one food sensitivity. See page 41 for the other 19 surefire signs (yes, yo-yo weight gain & loss is definitely one of them). Five ways to find the foods that are causing your symptoms...specific to your body. Believe it or not, one way is to do the exact opposite of what traditional doctors are taught to tell us to do! See how it works (and the other four ways as well) . You need skin scrape tests and blood draws in order to find food allergies, right? Wrong! The "usual way" totally backfires with false positives and false negatives when it comes to finding food allergies and sensitivities. Here's a brand new approach that's safer, WAY cheaper and quite frankly better and more reliable. Page 44. Can "junk food" sometime actually be good for you? Read pages 19 and 20 carefully. The shocking truth behind how much traditional doctors really know and DON'T KNOW about your nutrition and why this is critically important for you to understand if you suspect a food sensitivity. See page 4. Say goodbye to "micro-ailments" like stuffy nose, afternoon fatigue and mind fog (and over twenty others found on Page 40)! This new method automatically stops these in their tracks too...without doing anything extra. Discover the #1 flaw with Elimination Diets, why many times they don't work and exactly what to do instead. Page 49. If losing weight is one of your goals: One of the largest and longest running studies on weight management ever conducted found people who do this ONE simple thing compared to people who did not lost 200% more weight. See page 52 for what it is and how this fits with food sensitivity. A proven way to uncover your "suspect foods". Forget traditional medicine's usual "quick-fix solutions" of taking pills forever and surgery. This 3 Step approach works much better at finding the source of your problem and makes you look like a genius. Page 13. How to discover your "big bucket" food triggers in the next twenty one days - even if you eat lots of different foods and have no idea which ones are causing you trouble! Page 54. Where to find even the most hidden and stubborn ailment triggers. Two quick litmus test to see if you're on the right track. Page 42. Why there is a "quiet" revolution happening in medicine community and why an unusual amount of medical doctors are dropping out of traditional medicine and creating functional, integrative and holistic practices instead. And how this can help you crack-open your own ailment mystery. For gluten intolerant people: Discover the mysterious and little know story of how a respected hospital in Europe was unknowingly poisoning and killing their children patients and how a "cure" for an "incurable disease" was accidentally discovered...it's probably not the story you think it is...and despite all this, why mainstream medicine still claims food sensitivity is a joke and what it has to do with you. See page 10. Famous TV doctors say you should follow their nutrition guidelines, but you can feel better...faster...without them thanks to this new approach. When it's OK to be a "medical and nutrition dummy". I solved my own ailment mystery and food sensitivity with these two simple tools...a notebook and a pen. Since then I've made it even easier with the tool I'm going to show you on page 53. Forget about the fancy medical and nutritional stuff that's been confusing the heck out of you. The truth about food sensitivities. The stuff you see everyone else doing is failing, but this new method is easier and works like crazy. The blueprint walks you through it on Page 55. What to do if you're brand new at all this and you don't even know for sure if you have a food sensitivity. These simple to do home pre-tests are the best place to start. Page 37. How to avoid the most dangerous pitfalls nearly everyone falls into when assessing symptoms. See page 41. The 7 options you have if you suspect you have a food sensitivity and want to eliminate it. Making the wrong decision could cost you months or even YEARS of frustration and a small fortune. Page 48. The 3 simple and painless things you must do in order to find a problem food (or spice) you suspect is hiding inside dishes like soups, pastas and the prepared foods you're eating. See page 58. The Ferris Wheel of Pain and Suffering graphic...This shows you the 6 step cycle your body goes through EVERY TIME your ailment is triggered by a food...how it works won't be a mystery to you any longer. See the graphic on page 28. How to discover in the next 21-Days which of the 27 “big bucket” food categories, like cooked veggies, fruits or meats, your triggers fall into – even if you’ve been suffering for years and have no idea which foods are your triggers. See page 55. Once you've discovered your food triggers what to do next. See page 58. When it's okay to eat foods they say are "unhealthy" and why sometimes eating "healthy" foods is exactly what causes you to feel sick. Page 19. So you're saying I can never eat delicious tasting food again? WRONG! See page 59. The #1 worst thing you can do right now if you suspect you have a food sensitivity. See page 45. For people with yo-yo weight problems: Reduce this ONE thing in your body and it protects you against "extra" pounds, and a slew of other benefits too, WITHOUT changing your diet. See page 28 for the details. You’re right…that is a lot of real-world tested strategies and tactics. And it’s stuff that no body else can share with you because nobody else is looking at mystery ailments like this. Everyone else is looking for ways to essentially "cover up" or "numb" the symptoms...which many times cause even more side-effects. At the end of this book, you're getting the complete step-by-step of what to do about your trigger food AFTER you've found it. Most say just eliminate the trigger and stop eating it...that's one way. A lot of the times you can still eat and enjoy your trigger food with little or no problems. It's not hard at all. And like I said it's not as bad as you think it is. Remember my friend with the sneezing attacks from earlier. Her trigger is red wine...turns out she can still to enjoy a class on occasion. She's actually learned she likes white wine better so she drinks that most of the time when she has wine. The same is true for just about all trigger foods...there are work-arounds. Even if it's a worst case scenario, I think you'll agree, life without your trigger food, is a lot better than how you feel today! Biohacker's Secret Weapon: The Advanced Tool To Quickly Find Trigger Foods! In addition to the book, you’re getting a Golden Ticket the most powerful tools ever deployed for food sensitivity. It's a biohacker's secret weapon. You’ll learn how to automatically find your own trigger foods - without learning anything complicated or doing anything difficult. This simple but effective tool has given me answers to my ailments that nobody was able to solve and nobody else is teaching this. It's also the same tool designed for functional, integrative and holistic doctors to use with their patients. Listen, if you're totally frustrated with an ailment you can’t solve or get rid of, you’re not alone. I actually feared my mystery ailments were the sign of a serious disease. I was beyond frustrated. I’d literally question leaving the house because of how I felt and looked. It can be so difficult and lonely when you don’t know what to do. And that’s why I’ve spent years developing the tool and the system I’ll be giving you with this book. It's all about getting YOU results. First, you’ll finally know what’s going on with your body. You’ll come away with understanding why your body reacts the way it does. More importantly, your friends and family will finally be able to SEE what's going on in your body too. Their understanding and support is so important. They'll finally understand and believe what's REALLY happening...regardless if you decide to do anything about it or not. This is really important to you because it sets you up for long-term success. One of the most common questions I get are, “What’s going on with my body?" and "My body is different, how can my ailment be related to food I’m eating when my symptoms seem so random and different from everyone else I know?" Now you’ll know. That "unknowing-itch” you have about yourself will finally be scratched. And you’ll do it without using any pills or strict diets! Or doing anything overly hard or complicated. That’s because the system works automatically for you. I’ve created it using a combination of biology, physiological responses, psychology and advanced machine learning and a new approach called “Collaborative Food Sensitivity Data Mining”, that actually helps people like you automatically find their food triggers. The tool does all the hard work for you. Yes, you heard that right. If you want it to, the system actually finds your food triggers for you automatically when you use this new approach I’m including with the book. The "cost" of this book is $7 and you get it instantly as a download. You can access it anywhere, immediately, without having to wait for the mailman. I realize $7 is very inexpensive…so you might wonder what the “catch” is. I’m literally giving you this entire book and bonuses, for $7, as a means of “putting my best food forward” and demonstrating real value. I also want people like you to use the system and give me feedback if you want to. My hope is that you’ll love it and this will be the start of a good professional relationship for years to come. In most cases I take a loss when selling the book at this price. It costs me just over $35.00 in advertising expense alone to sell a book. And I've invested tens of thousands of dollars into the research and development of the tool. Don’t worry – I don’t have a sales team that will call you and bother you or anything like that. It’s actually the opposite. I’m betting that you’ll enjoy the book so much, you’ll contact me! Anyway – with all that said, this is a very time limited offer. In this training, "The Godfather of Food Sensitivity" walks you through exactly what happens to your body when you eat a food you’re sensitive to and a specific way to find your unique trigger foods. You'll get the food sensitivity test you can do right now...from home. You’ll be able to actually “watch” the reactions (when you know what to look for) as your body responds to food. You’ll get step-by-step instruction on his entire method. If you suspect you have a food sensitivity, this is a must have. He wrote it specifically for the public so it's easy to read. "The reward for...heeding what it shows you can mean the addition of ten to twenty more years to your life . . . years free of high blood pressure, heart attacks, headaches and a score of other ailments. " And there’s no charge for it here. I want you to have a copy as my gift for checking out my book. I 100% Guarantee you’ll love this book and the manuscript or I'll return your $7, let you keep the book and the manuscript anyway. That's right. That means if you don't absolutely love what I'm giving you, you don’t have to send anything back. Just email me at the address on your receipt and I’ll give you back your $7 with no questions asked. I’m offering you a 65 page book that outlines how to solve your food sensitivity related ailments and find your specific food triggers…even if you’ve tried everything in the past. The book is $7 today. I’m also giving you a "Golden Ticket" to try the tool I created that automatically finds your trigger foods for you. What’s important about this is that it takes your information (aka "clues") and uses advanced statistics and machine neuroscience and applies them to automatically find your food triggers for you. It’s like having a super computer who’s job it is to find the needles in the haystack. (And in my experience it’s easier to have a computer find your triggers for you…it simply works better.) It's the same tool that was designed for functional, Integrative and holistic doctors use with their private clients. 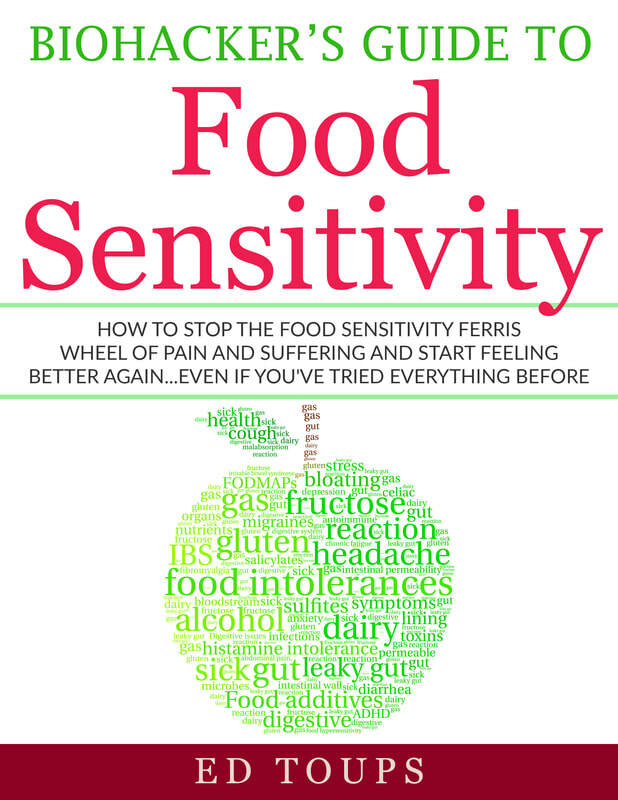 On top of all that, I’m also giving you the out of print manuscript on food sensitivity, free, which shows you exactly what’s going on with your body when you eat a trigger food and how to find them quickly. This is a very limited offer because it’s a test. There’s no “catch” to this offer. You will not be signing up for any monthly program or anything like that. In fact, if you don’t like the book let me know and I’ll even give you back the $7. You don’t even need to send the book back.